Warringah 52.5 carr 53 (D Oliver) last. 3/4 len, 1-1/2 len. Time: 3:23.87. (Last 600m 36.60). Most years I sit down and do a little study into the pedigrees of the horses running in the major Australian horseraces. I am not remotely interested in betting, but I do appreciate a good horse and get a lot of enjoyment linking history and horses. Thoroughbreds are of particular interest to me – and if you ever get a chance to see it, I do have a bookshelf devoted to tests the history of Thoroughbred, Arabian and Standardbred horses in Australia! Unfortunately, this year I did not get a chance. Otherwise I might have taken more notice of the eventual winner, Australian-born Shocking (b h 2005 Street Cry (IRE) from Maria Di Castiglia (GB), by Danehill (USA)). As I have to run out the door to do some errands, I cannot ponder too much longer on this; but I pose this question: what kind of impact have descendants of Danehill (USA 1986) had on the major Australian horseraces? In restrospect it does not seem a huge surprise that a horse of Shocking’s calibre would take out Australia’s major horserace. A grandson of Danehill on his dam’s side, and a direct male line descendant of Native Dancer (USA gr h 1950), he carries some high quality bloodlines! One thing that fascinates me is that every name in a horse’s pedigree is a tie to the history. Every one of those horses has been bred for a purpose, linked to people who perhaps tied their hopes and dreams into their animals, and many of these Thoroughbreds carry an impressive genealogy of major race winners with them. If only I had more time to explore these ideas, but more pressing priorities await! Pencil on paper, February 2009. More Russians. 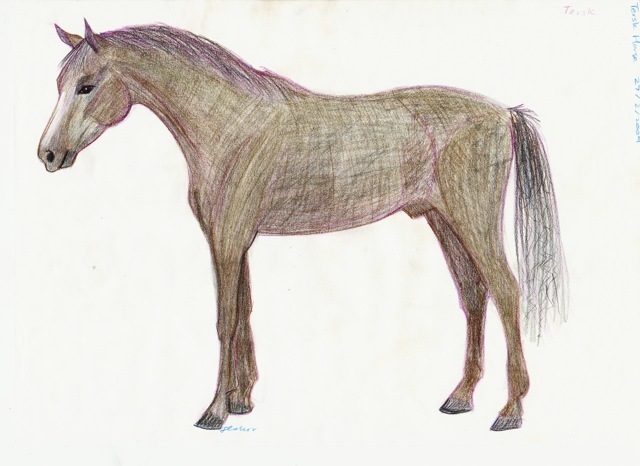 This is a concept sketch developing ideas about drawing the Tersk breed of horse. In the photos I’ve seen of this breed, I thought they had beautiful Arabian-like profiles. All links accessed 5 March 2009. Graphite pencil on paper, February 2009. Another Russian-style horse. This one is based on the Don breed. This illustration is available for sale in various printed formats, including greeting cards, canvas prints and laminated prints. See http://flokot.redbubble.com/sets/46856/works/2652453-2-russian-inspired-horses-2 for more information.. It must be all the Tolstoy and Dostoyevsky books on my bedside table, or the interest in Eastern European culture I”ve developed since marrying a part-Ukrainian… but I thought I’d have a go drawing Russian types of horses. As most of the time I draw Arabians or Thoroughbreds, it was kind of nice taking a break and drawing the Russian breeds. This one is inspired by the Budenny breed of horse. I’ve got this for sale as an art print, available in various formats including matted and framed prints and greeting cards. Go to http://flokot.redbubble.com/sets/46856/works/2652444-2-russian-inspired-horses-1 for more information and to view in larger size. Do Unicorns exist, or have they ever existed? Feel free to leave an answer in the comments section. All views will be tolerated and it’s not meant to be a debate forum – just share what you think! You are currently browsing the archives for the Horse Breeding History category.